Synopsis: Twenty-four hours can change your life. . .
What I thought: After I read Just One Day, I was desperate to know more. What happened after Allyson arrived on Willem's doorstep? Were they going to be together? Then I found out about Just One Year and while it wasn't exactly a sequel, it was more than enough to satisfy my craving to know more. Of course, everyone wondered what Willem had been doing during that year they were separated. Did he try to find her? Did he think about her? Or had he forgotten about her after he mysteriously left? Just One Year answers all those lingering questions, and we get to know a lot more about Willem, his past and just who he really is. Just One Year is a lot like Just One Day, except it's spread over a lot longer span of time (obviously). What I loved most about this story, was getting to know more about Willem's past. We learn more about his family, the reason he is a constant traveler, more about who he really is - and what I discovered is that I love Willem so much. He is an extraordinary character, with many faults but also many strengths as well. His life is certainly outrageous and just a bit dysfunctional, but we learn the reasons for this throughout the story. While Just One Year definitely answered many of my questions, I've still been left with this burning desire to know "What happens next?" I loved Allyson in the first novel and I fell in love with Willem even more in the second, so I just want more more more of them! Seriously. Give me more now! 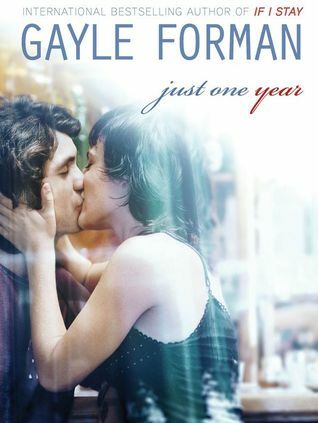 So if you loved Just One Day or you just love Gayle Forman's amazing writing, then you will definitely need to give Just One Year a read too! The Good: I love when you get to read a sequel/companion style novel like this, so you get more out of the original story. This was a great insight into Willem's mind and what happened over that missing year.